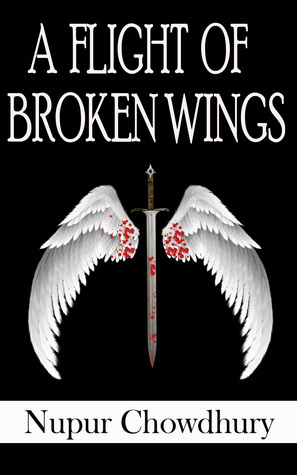 A Flight of Broken Wings by Nupur Chowdhury is the first book in the series of three. It is author's debut book. The plot of the story based on a war between humans and Aeriels. The cover page is simple. I like the wings which indicate to Aeriels, but the sword makes me confused because there is a mention of sif blades, not actual swords. So the cover page gives me mixed feelings. The main character of the story is Ruban Kinoh. He is the best Aeriel hunter in all of Vandram (a fictional place on the Earth). Simani, she is one of the best IAW agents and a partner of Ruban. Tauheen, Aeriel queen and the villain of this story. Apart from them, there is Subhas, chief director of IAW (Intelligence and Analysis Wing) and Ruban's uncle. Ashwin Kwan, a Zainian nobleman. Aeriels live in Vaan and humans on the Earth. They both hate each other. The humans developed a formula which kills an Aeriel in a single shot. But it was stolen by Aeriel Queen Tauheen for her own devilish plan. The story revolves around Ruban and his teammates how they stop her and save the Earth. In their conquest, Ruban confronts his loved ones and torn apart when he knows the truth about his life. Ruban's father and lover Miki died in an accident. He always thought that his past was only black and white and tries to make peace with the ugly truth. But soon he realizes that there are other shades too which he never thought about. The people around him were not the one he thinks they were. Ashwin helped Ruban in discovering the truth about his life as well about the Ariels. Soon they became an ally. But Ashwin has his own hidden agenda. During a fight, Ruban knows his secret. It changes their whole relationship. Every human is not bad some are good too. Ruban experiences the same thing on his journey about the Aeriels. He learned Aeriels history and understands the facts or myths before the Rebellion. This new conclusion helped him to make peace between Aeriels and humans. But can he kill Aeriel Queen? What is the truth he finds out about Ashwin and his own life? What happened when Ruban know that all the things were a big fat lie? For all the answers you need to read the book. This story is about grief, betrayal, and revenge. There are few grammatical errors and spelling mistakes. The name of the characters confused me. I really don't like them. That's why I cut .5 stars. The story is firm, but it is slow-paced. All the characters were planted properly by the author. I am impressed by her writing and detailed description of every sequence. The story has its twist and turn. Nupur Chowdhury was able to create suspense in the story. It hooks readers from start to the end. The author gives a proper ending which I really like. The language and word choice are striking. The Aeriel Queen Tauheen character is one of my favorite. She is a manipulating psychopath, and the author describes her in a proficient way. The characters grow with the story. If you love reading fantasy, this book is perfect for you. I really enjoy reading it. I recommend it to all fantasy lovers, and a newbie so they know what a debut work looks like. Six hundred years ago, humanity rose up in revolt against the Aeriels, who were driven from the Earth and back into their homeland of Vaan after a bloody and glorious war. Eight years ago, Ruban's home was destroyed and his family murdered by an Aeriel. When a new Aeriel threat looms over Ragah, the capital city of Vandram, Ruban Kinoh must do everything in his power to avenge his family's past and protect the future of his country.